This is a lovely custom made Mother's or Grandmother's Bracelet. Shown in the photo is a 3 strand with 3 names. For this three strand bracelet you would order a quantity of 3. It would be $150. You can also order a 1 strand $50, 2 strand $100, 3 strand $150, or a 4 strand $200. The bracelet is made with all sterling silver and Swarovski Austrian crystal components. It is custom made to wrist measurement. Measure your wrist at the smallest point and add an inch to the measurement. This will allow for movement. Or if you are ordering for a gift you can "guesstimate" and order petite small 7", medium average 7.5", or large 8". If you have any questions at all please message us. Also when ordering please message us the names you will need on the bracelet and their birthmonth. 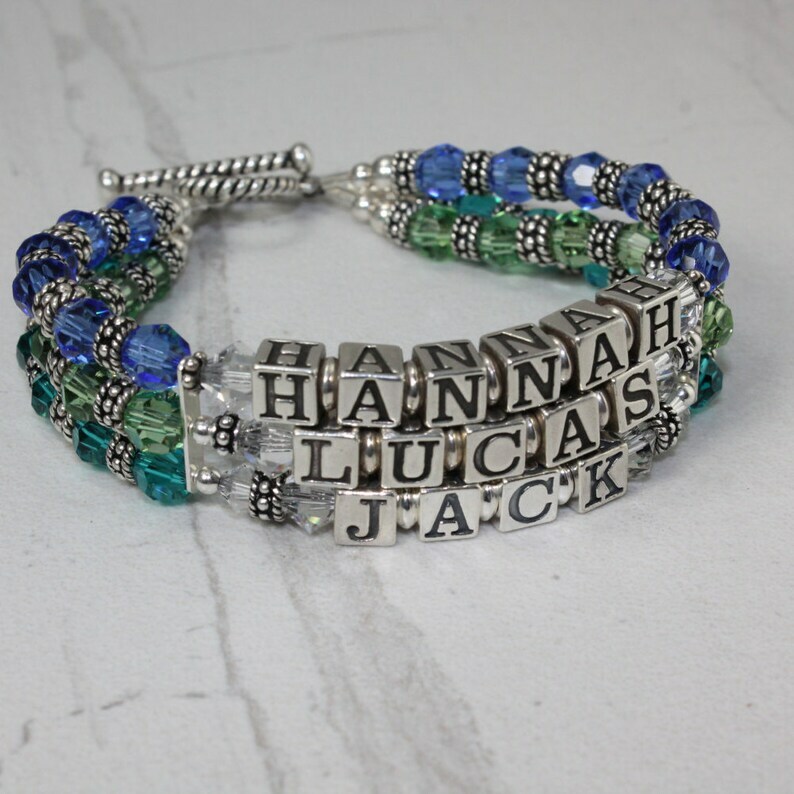 Shown in this photo the Jack sterling letter blocks are lighter because this mom had had her bracelet with Hannah and Lucas for several years and then had baby Jack so she mailed us her bracelet and we added the new baby's name. The Hannah and Lucas strands are several years old and the Jack strand is brand new. We have been making these bracelets over 25 years and add new strands for people everyday. I ordered this bracelet with four strands. It's absolutely beautiful and I always get compliments on it. It was shipped quickly and there were no issues.